...is the leading provider of knowledge management and consulting services to the industrial gases business. Spiritus gives independent advice based on in-depth knowledge and experience of the industrial gas industry to businesses or organisations in order to assist them in enhancing their decision making processes on issues related to industrial gases, equipment and services. Spiritus maintains the highest levels of confidentiality for its clients to ensure no leakage of sensitive client information. 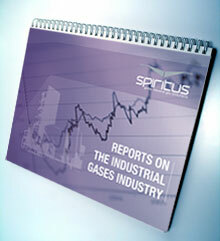 Spiritus also maintains a unique knowledge base of the current and the historical global industrial gas business. The Industrial Gases or Technical Gases business has developed over 130 years to be an important part of many different industries. Originally based on the separation of air and the use of the individual components such as oxygen, nitrogen and argon, the industry has very much evolved to encompass many different gases with a variety of physical characteristics that lend themselves to many difference uses. The industrial gas business is a unique industry as it is normally classified within the wider "Chemicals" sector, it is more of a service industry, serving a wide variety of different industrial sectors (steel/metallurgy, petrochemicals, energy & refining, manufacturing, electronics, food, glass and many more). The companies directly involved in the industrial gases business range from large multinational companies producing and supplying gases, small and medium sized gas suppliers, gas distributors, to equipment manufacturers (cryogenic storage vessels, gas plants, compressed gas cylinders and other distribution equipment. For further information on Spiritus industrial gas consulting please see our company background.